Home Unlabelled AIPCA asks Raila to desist from inciting Kenyans to violence. AIPCA asks Raila to desist from inciting Kenyans to violence. The African Independent Pentecostal Church of Africa (AIPCA) has appealed to NASA leaders Raila Odinga to refrain himself from any calls for mass action tomorrow (Tuesday) as this would cause disharmony in the country and probably result in chaos as witnessed after the 2007 elections. 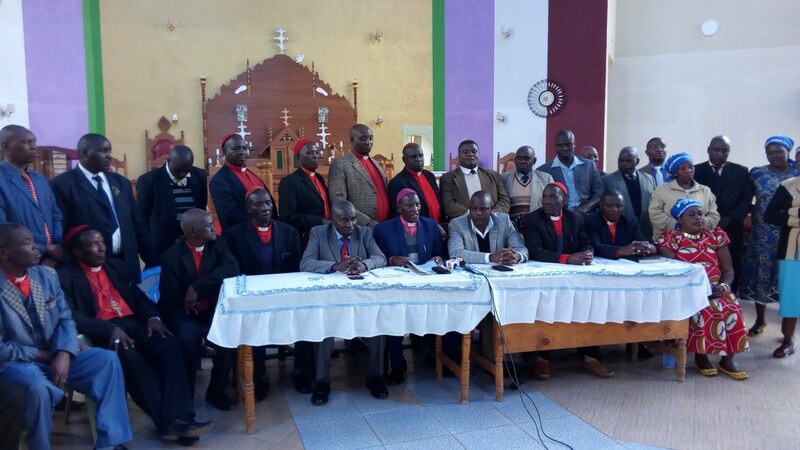 In a press statement read by the Archbishop Julius Njoroge at the AIPCA church Thika on Monday, the faithful appealed for calm and pleaded with anyone who felt aggrieved to follow the laid down constitutional framework to seek for justice. “We urge anyone aggrieved by the outcome of the just concluded elections to use the dispute resolution mechanisms entrenched in the constitution and other statutes to resolve their grievances. We urge The Right Hon. Raila Odinga to respect the decision of the electorate and desist from inciting his followers and causing panic in the nation,” read the statement. The church underscored the importance of peace in the country, reminding Kenyans that peace was paramount. “You cannot know the value of peace until you lose it. You should therefore shun the leaders who were hell-bent to cause disharmony in our society,” said the archbishop. He added that even though the right to demonstrate was constitutional, demonstrators should do so within the precincts of the law without infringing on the right of others. He urged the police to be vigil in enforcing the law especially against those bent towards breaking the law but cautioned them to respect the sanctity of human life. The church congratulated President Uhuru Kenyatta for his reelection, terming his endorsement as a show of confidence by the people for his leadership. They were also happy that he had extended an olive branch to his competitors but appealed to his government to seek ways to accommodate those who did not vote for Jubilee Party. They gave the IEBC a clean bill of health commending them for their extemporary performance that validated the results in the just concluded elections. “We believe the outcome of this election was fair and a true representation of the will of the Kenyan people,” said the archbishop. National chairman Paul Watoro Gichu appealed to Kenyans to ignore the opposition’s call for mass action and asked citizens to get back to work as there was need to build the nation. He reminded President Uhuru Kenyatta that he was president to all the 44 tribes of Kenya and he should serve all without fear or favour. He also appeal for the unity of the church and asked the faithful to pray for peace in the country.